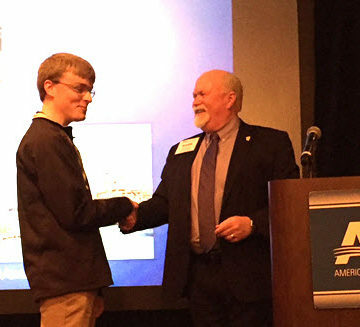 ASCE President Mark Woodson congratulates Nathan Shellhamer on winning the Dream Big Contest grand prize. Onstage, Nathan Shellhamer was smiling, but truth be told, he wasn’t totally sure what he was doing there. ASCE President Mark Woodson began telling the Multi-Region Leadership Conference crowd in Pittsburgh about the three “dream” prizes in ASCE’s Dream Big Contest. Then Woodson announced his name as a winner. The contest gathered civil engineering dreams from ASCE members all around the world in honor of Dream Big: Engineering Wonders of the World, the forthcoming ASCE giant-screen movie, produced by MacGillivray Freeman Films with Bechtel Corporation as a presenting sponsor. Shellhamer won a trip for two to an international location shoot for the filming of Dream Big. Marta Alvarez, P.E., L.S., M.ASCE, president of YCE Engineering & Surveying in Ventura, CA, won a Dream Big premiere event to be held in her local community. 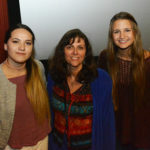 Rocio Rodriguez, P.E., M.ASCE, a structural engineer for Siemens in Orlando, won a trip to attend an exclusive rough-cut screening of Dream Big in Laguna Beach, CA. Shellhamer’s trip will take him to either Dubai, Rome, or Venice, depending on the film’s shooting schedule. He’s thrilled with any destination. While Shellhamer will be leaving the upper Midwest for points overseas, the other Dream Big winners – Alvarez and Rodriguez – started abroad before moving to the United States. 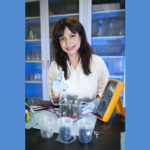 Rocio Rodriguez is a professional engineer for Siemens in Orlando, FL. Rodriguez grew up in a little town in the mountains of Costa Rica. She came to America for graduate studies at the University of Kansas. When she started in civil engineering, she never imagined she would have the job she does now at Siemens – working to design wind-energy towers. Most recently she has been working on a super-slender concrete tower that is 115 meters tall with only a 7-meter base. Rodriguez wasn’t on stage with Shellhamer to learn of her Dream Big Contest prize, but she was overjoyed after being informed by ASCE via a phone call. Marta Alvarez teaches students about surveying at a Brighter Horizons outreach event in Thousand Oaks, CA. Alvarez followed her father into engineering, but unlike him, she wanted to start her own business. While still in her twenties she did just that, and YCE Engineering & Surveying continues to thrive years later, with seven employees and a long list of successful projects. Alvarez often packs up her surveying plans and gear and visits local schools and community events to promote the profession to students. She sees Dream Big as a great means of outreach on an even larger scale. Shellhamer is just getting started with his career, but he already has big dreams as a transportation engineer. “I want to get out there and make a difference,” he said. “As engineers we have this unique opportunity to take what we’ve learned and apply it, and see it affect a large group of people. Shellhamer said he’s watched the Dream Big trailer three or four times, now with new anticipation both for the film and his trip.